Our cinema is outfitted with 5.1 Dolby Surround Sound and a NEC iS-8-2K DLP Projector. The screen size is 13' x 5'. Maysles Cinema is 51 seats. The reception, party and meeting room is available for rent either on it’s own or in conjunction with the cinema. The reception area can also be used as an additional screening room (for Blu-ray, DVD, Computer only). This cinema themed room has a capacity of 60 people seated and 110 standing. Please note that a minimum 30% (of full rental fee) deposit is required to reserve the space for all hourly rentals. 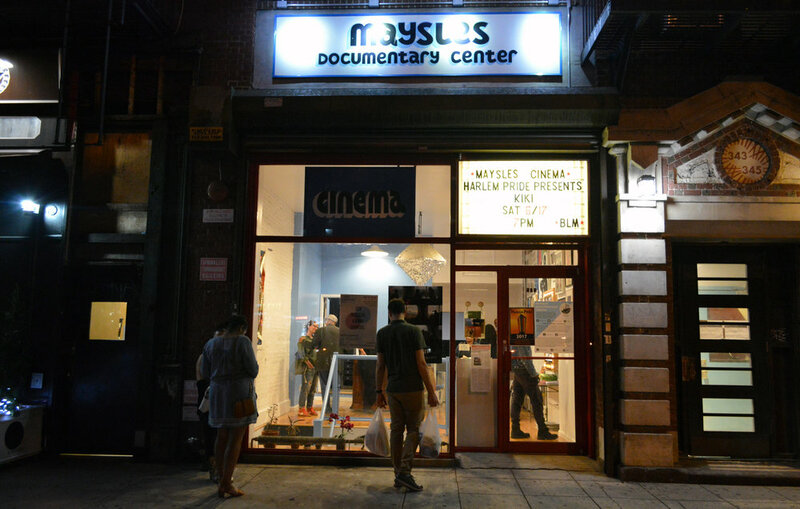 What types of screenings can take place at Maysles Cinema? Our cinema is available for private and public screenings, Oscar-qualifying runs, press screenings, premieres, work-in-progress screenings, weeklong runs, and DCP tests. My film is not a documentary. Can I still screen it at your cinema? Yes. Our rental program is open to films of all genres. What screening formats does Maysles Cinema support? DCP, Blu-ray, DVD, Apple ProRes (via HDMI connection), 16mm in select cases. Our cinema screen is 13’ x 5’. Maysles cinema is outfitted with 5.1 Dolby Surround Sound and a NEC iS-8-2K DLP Projector. Our equipment is MPAA-certified. Our cinema holds 51 seated. Our downstairs overflow/reception area has a capacity of 110 (standing) and 60 (seated). What if I have more than 51 people who want to attend a screening? Our downstairs reception area can be used for simulcast. Yes, all rentals include a staff projectionist/house manager. We can also provide a ticket taker for an additional fee. Can I charge admission/sell tickets to my screening? Yes, you can sell tickets/charge admission to your screenings and keep all proceeds. Maysles Cinema only requires the rental fee as payment. I am renting on behalf of a nonprofit, can I get a discounted rate? For select non-profit agencies we are able to offer a discounted rental rate.